Arron Afflalo playing like an All-Star — but will he be one? Arron Afflalo has increased his points per game average in each of his seven NBA seasons. Arron Afflalo has never had a season like this, one in which he is averaging more than 20 points a game for the Orlando Magic. The problem, however, is that the Magic have never had a season where they’ve been this far below the .500 mark yet wound up getting someone chosen to play in the NBA All-Star Game. But with so many other Eastern Conference teams bogged down with losing records, the chances of the conference’s coaches rewarding Afflalo with a trip to New Orleans the weekend of Feb. 16 might not be so remote. The Magic’s game Wednesday night at Toronto could even be viewed as an opportunity for him to strengthen his case against two Raptors guards who should also merit consideration, DeMar DeRozan and Kyle Lowry. Rashard Lewis, now of the Miami Heat, was the most recent member of the Magic to make the East squad as a non-starter. That happened in 2009, a season where they advanced to the NBA Finals before losing in five games to the Los Angeles Lakers. The only other players in franchise history to be so honored were Dwight Howard in 2007 and Tracy McGrady in 2002. Jameer Nelson was picked the same year as Lewis but could not participate because of an injury. Afflalo went into the Magic’s loss Tuesday night at Detroit with a 20.4-point scoring average, almost four points more than he averaged in 64 games after coming to the Magic from the Denver Nuggets as part of the trade which sent Howard to the Lakers. If he continues at his current pace, it will mark the seventh time in as many seasons in the NBA that he has increased his average from the year before. 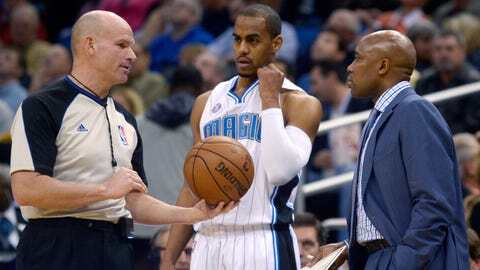 Magic TV analyst Jeff Turner says that Arron Afflalo is playing at an all-star level, and he hopes the Magic guard will make the Eastern squad. Like Afflalo, DeRozan is averaging almost 38 minutes per contest while scoring more than 20 points. He is coming off a week where he poured in 40 points against the Dallas Mavericks and 34 against the Philadelphia 76ers as the Raptors joined the Heat, the Indiana Pacers and the Atlanta Hawks in the exclusive club of East teams with winning records. A year ago, two guards from sub-.500 teams in the East — Kyrie Irving and Jrue Holiday — were among the conference’s reserves. Coaches can’t vote for their own players, meaning Jacque Vaughn is limited to lobbying his colleagues on Afflalo’s behalf. The coaches will vote for two guards, three players who play either forward or center, and two players where the position is not a determining factor. 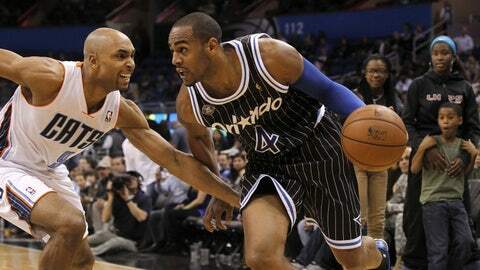 Afflalo began the season as the starting shooting guard for the Magic but has since been moved to small forward to allow rookie Victor Oladipo to join Nelson in the backcourt and get more minutes. Lance Stephenson of the Pacers and John Wall of the Washington Wizards are considered locks to be chosen, meaning no more than two players are likely to be picked from a group consisting of Afflalo, DeRozan, Lowry and the Hawks’ Jeff Teague. According to the NBA’s advanced statistics, Afflalo has an effective field-goal percentage of 53.6 percent, which is exactly the same as Lowry’s and ahead of that of both DeRozan and Wall. Effective field-goal percentage is a number that is adjusted for made 3-point field goals counting 1.5 times more than a 2-point shot. Afflalo has already hit more 3s than he did all of last season. Debates over who should and shouldn’t make either the East or West squad tend to be an annual occurrence, with players from teams at or above .500 generally getting the benefit of the doubt.